The rotary drum screens are applied for separating solids from process and wastewater. The screens are robustly built and can be executed with a frequency controlled drum drive, a high pressure spray cleaning installation and/or can be made out of a more corrosion resistant construction material than AISI 304. The rotary drum screens are characterised by maximum separation efficiency against low running and maintenance costs. The cylindrical drum sieve, made from wedge wire, allows the water to pass however coarse particles are held back by the outer drum surface and are carried, in a rotating movement, to a scraper mechanism where they are removed. 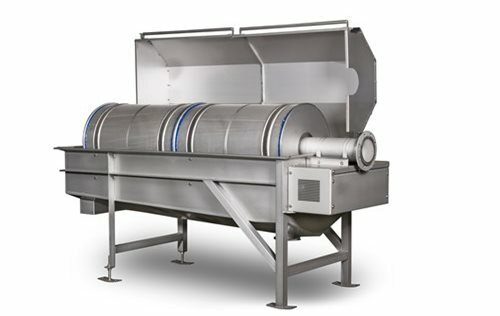 A special time controlled drum scraper interaction prevents the build up of meat particles, peels, hairs, fibres, etc. which increases the separation efficiency. All systems have a spray pipe installed into the drum in order to prevent build up of adhesive materials to the outer drum surface. Spray cleaning takes place over the full lengths of the drum, ensuring a continuous operation with a minimum of maintenance.